Given that nearly 60% of the Listed Investment Companies (LICs) in our coverage have delivered strong outperformances over its benchmark over the last 10 year p.a. - we still see the compelling proposition a LIC presents in an investment portfolio. 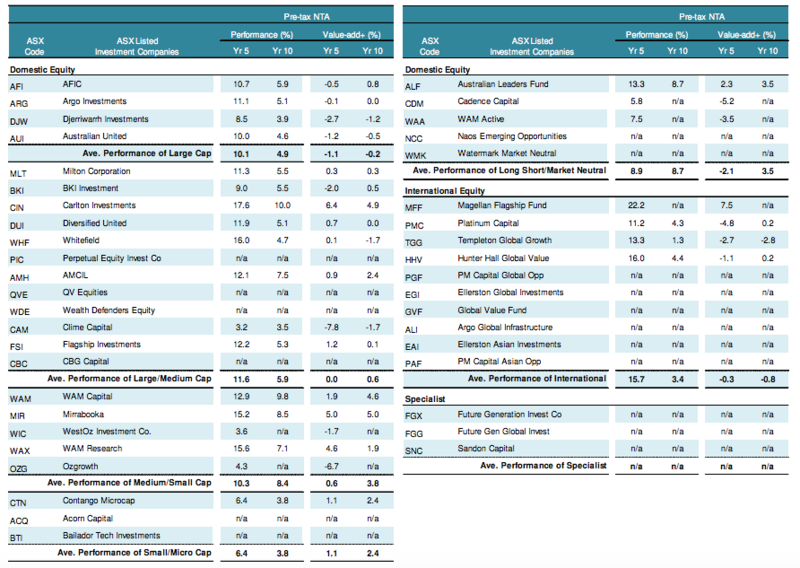 In our new LIC Quarterly, Analyst Nathan Umapathy profiles 42 LICs detailing: historical performances over 1, 3, 5 and 10 years on an accumulation basis; active return relative to a benchmark; NTA data; reported portfolio composition; investment strategy; manager profile; dividend policy and history; and risk/return gauges. We discuss the costs associated with LICs and why some Managers have a higher fee structure. Our key picks for the sector are also identified across pre-tax NTA and share price performance, distribution yield based on the previous 12 months and including Special Dividends, and valuation. Given that nearly 60% of the Listed Investment Companies (LICs) in our coverage has delivered strong outperformances over its benchmark over the last 10 year p.a. - we still see the compelling proposition a LIC presents in an investment portfolio. Fees, however, are part and parcel of any investment vehicle, including LICs. Fees can have a significant impact on the value and success of an investment. Therefore, this is an important topic for us to examine. In this edition, we discuss the costs associated with LICs as well as adding some clarity to why some Managers have a higher fee structure. Management fees seek to recover general day-to-day expenditure of the investment process. Traditionally, management fees range between 0%~2% within the LICs in our coverage. While, administration fees incorporate all other expenses incurred in the professional management of the fund. For example, these expenses include director fees, rent, audit, legal, etc. Note that, these fees are charged regardless of how the fund has performed. This may vary considerably from fund to fund depending on the investment mandate, style and approach. Performance fees seek to directly align the profitability of the manager and the performance of the underlying fund. A performance fee is best described as a reward for performing above the fund’s stated benchmark. Typically, the performance fee ranges between 10%~ 20% of the value above the benchmark. The structure of a performance fee needs to be considered to ensure fairness and alignment of interest between the Portfolio Manager and investor. Investors should note that while lower fees do not guarantee superior performance, it is less of an impediment on returns. In fact, many of the higher fee mandates operate in less efficient portions of the market and can outperform the market, i.e. smaller caps mandate LICs. Indirect Cost Ratio (ICR) measures the total indirect cost of LIC. These expenses generally include management fees, performance fees, legal, accounting, auditing and other operational and compliance cost. The aggregation of these indirect costs are divided by the average pre-tax net tangible asset of the year and presented as a percentage. Throughout our coverage, we produce both the ICRs with and without performance fees for all our LICs. Our analysis of the LICs in our coverage alludes to some interesting facts. First of all, investors need to be aware that certain strategies are more cost intensive to execute than others. This could be due to the heavy resourcing required to effectively implement a mandate (international assets), a lack of research coverage in an underlying market (small caps) or sophisticated investment strategies (long short, infrastructure assets). Secondly, the specialised nature of these strategies in less efficient parts of the market may give the Managers the consistent ability to outperform the market or deliver an effective risk weighted return. However, this clearly needs to be evaluated in the context of the offering. 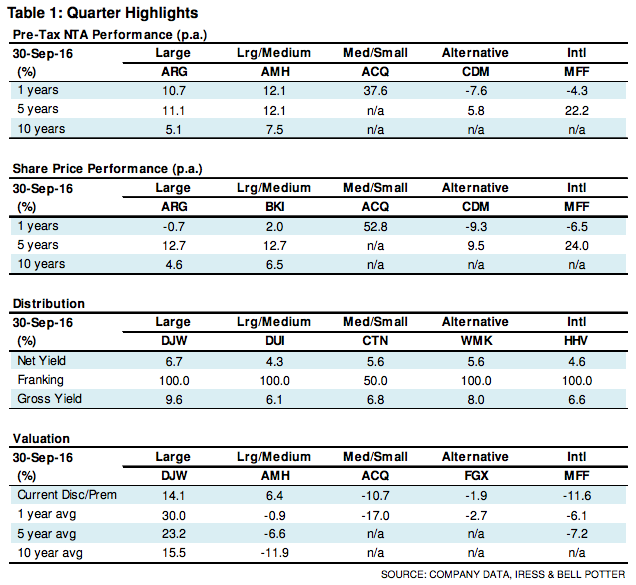 Putting this into perspective, the average performance (pre-tax NTA) of Large Caps focused LICs in our universe is 10.1% over five years and 4.9% over ten years, Large to Medium Cap LICs is 11.6% and 5.9% respectively, while Medium to Small is 10.3% and 8.4%. Small to Micro LICs is 6.4% and 3.8%, Long Short/Market Neutral is 8.9% and 8.7%, International is 15.7% and 3.4%. However, there is not sufficient data for specialist LICs over the periods.